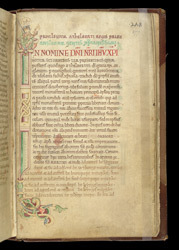 Once belonging to the monastery of St Augustine in Canterbury, this manuscript has a collection of saints' lives, many of them associated with Canterbury or Kent. Several of the lives are the work of the biographer Goscelin, a Flemish benedictine monk who came to England with Hermann, Bishop of Salisbury, probably in 1053. He went on the road to gather material from all over the kingdom, writing the lives of the English saints as he travelled, finally settling at Canterbury. This manuscript may have been copied within a decade of his death, at Canterbury, making it an important record of his work and evidence of the cults of saints there. This page comes from a section of charters at the end of the manuscript granting privileges to St Augustine's abbey by Edward the Confessor and Aethelberht. It has a charter which was supposed to have been by Aethelberht--but probably is a forgery. The abbey of St Augustine's had high status because of its foundation by Augustine, the missionary monk whom Pope Gregory the Great sent from Rome late in the 6th century. Nevertheless it had to assert its rights against the attempts of the archbishops of Canterbury to control its affairs and charge fees. The charters represent an attempt to boost the abbey's authority in the face of infringement. Depiction of the king draws attention to the royal authority of the charter, and the handwriting style looks back to that of some Anglo-Saxon royal charters of the early 11th century, another enhancing touch.